Welcome to my first installment of "Make It!" I plan to make this a regular feature on my blog throughout the upcoming year so check back for inspiring ideas for a variety of projects! Looking for a quick and easy Valentine garland? What is better than a combination of paper bags, muslin and twine! Grab the goods and go Make It! Gather your supplies: brown paper bags, red thread, sewing machine, scissors, muslin, needle nose pliers, jump rings and twine. 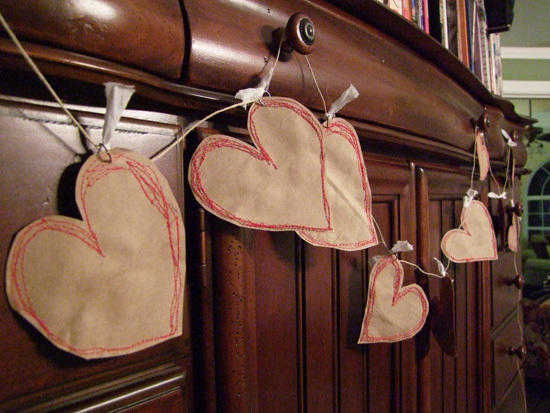 Free motion stitch hearts onto paper bags. Stitch about twelve - fifteen hearts. Cut a piece of twine and loop the end and add a knot with a piece of muslin tied to it. This will be repeated at the other end once the garland is finished. Add jump rings to the top of each heart and thread the twine through all the jump rings, adding the hearts to the garland. Slip a small strip of muslin inside each jump ring. Tie strip of muslin around twine to secure heart to the garland. Repeat on all hearts, spacing them along the twine as desired.